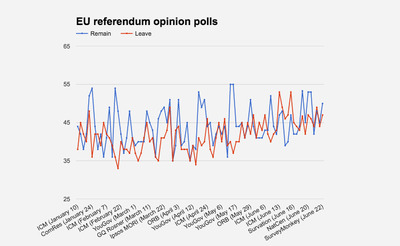 SurveyMonkey poll shows swing to Remain vote on the day before the referendum. Says British voters 50% want to Remain; 47% want to Leave. But EU referendum is still too close to call. Voters have moved “decisively — albeit narrowly” towards a Remain vote in the EU referendum on June 23, according to an updated poll released this morning by SurveyMonkey. 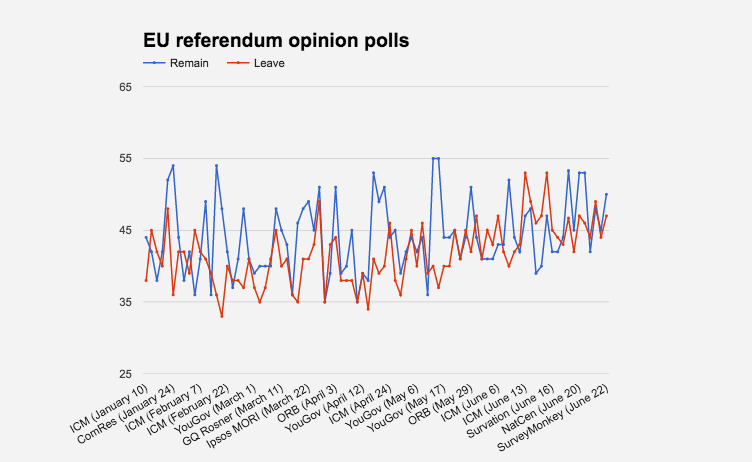 Just 24 hours ago had Leave at 49% and Remain at 48% in another SurveyMonkey poll. In the grand scheme of things that might look like quite a small swing for Remain, but a day before the polls actually open, it is a massive move. This SurveyMonkey news is important because it was one of the few polling companies to correctly predict the outcome of the 2015 General Election, which saw David Cameron’s Conservative Party win a majority. Male voters are split down the middle, with 48% Remain; 49% Leave. Before now the gap was 10% in Leave’s favour. Remain and Leave voters who say the referendum is now the UK’s number one issue are even. A previous survey showed Leave was 10 points ahead in this regard.